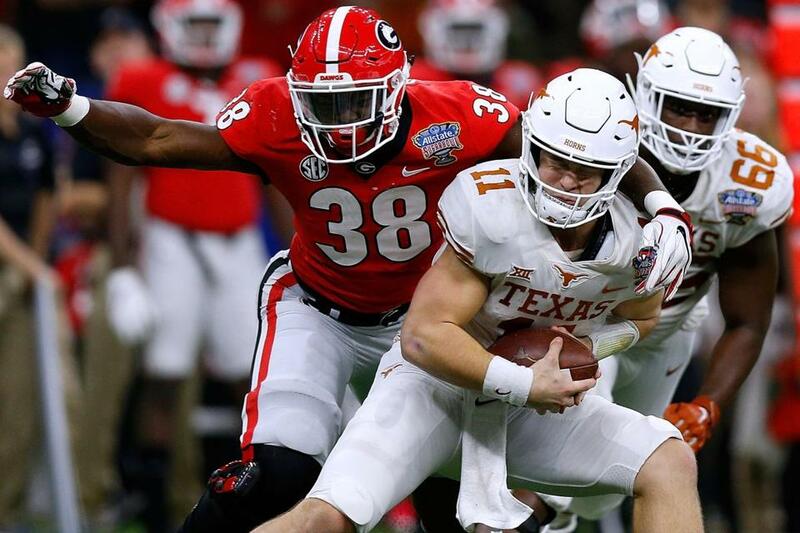 Texas quarterback Sam Ehlinger saw his share of pressure from the likes of Georgia’s Azeez Ojulari and only threw for 169 yards, but he made up for his legs, scoring three times on the ground. Sam Ehlinger ran for three touchdowns, the Texas defense largely held Georgia’s offense in check, and the Longhorns earned their first 10-win season since 2009 by beating the Bulldogs, 28-21, in the Sugar Bowl on Tuesday night in New Orleans. Ehlinger was the star of a gritty win, running for a 2-yard touchdown in the first quarter, a 9-yard score in the second, and a 1-yard TD in the fourth. The 6-foot-3-inch, 230-pound sophomore finished with 64 yards rushing on 21 carries and also threw for 169 yards. Even the Texas mascot was in a feisty mood. Texas athletics spokesman John Bianco said ‘‘all established safety and security measures were in place for Bevo’’ at the Sugar Bowl, including two halters, two chains, and six handlers to hold him. In the game, No. 14 Texas (10-4) continued its quick rise under coach Tom Herman, capping his second season with a Sugar Bowl win that will surely send expectations soaring after nearly a decade of mostly mediocrity. Texas stretched its lead to 28-7 with 11:49 left in the fourth quarter on Ehlinger’s 1-yard run, finally scoring on fourth down after his first three attempts at running for the score fell just short of the end zone. No. 6 Georgia (11-3) was a 12½-point favorite and claimed it would be ready for the Sugar Bowl despite just missing a spot in the College Football Playoff after a loss in the Southeastern Conference championship game. But a sloppy opening sequence indicated otherwise. Texas jumped out to a 17-0 lead by early in the second quarter, largely because of Georgia’s mistakes on special teams and offense. The most costly was when D’Andre Swift fumbled deep in Georgia’s territory, giving Texas possession at the 12. Three plays later, Ehlinger deftly escaped trouble in the pocket and scored on a 9-yard run to give the Longhorns a 17-point advantage with 14:53 left in the second quarter. Fromm completed 20 of 34 passes for 212 yards, three touchdowns, and one interception. The Bulldogs scored a touchdown with 14 seconds left to pull within 28-21 but Texas recovered the ensuing onside kick. There will be no self-proclaimed national championship for Central Florida this year. LSU snapped UCF’s 25-game winning streak with a 40-32 victory at the Fiesta Bowl in Glendale, Ariz., with Joe Burrow dissecting the Knights’ secondary for 394 yards passing and four touchdowns. UCF, which was never in serious consideration for a spot in the four-team playoff, was eighth in the final college football committee’s rankings. A depleted LSU team rolled for 555 yards, easily the most allowed by the Knights this season. Burrow had touchdown passes of 22, 49, 33, and 32 yards. UCF, meanwhile, managed just 250 yards after entering the game ranked third nationally at 545 yards per game. Earlier, back in Baton Rouge, a prosecutor said two LSU football players appear to have responded with justifiable force when they fatally shot an 18-year-old man who was allegedly trying to rob them at gunpoint. East Baton Rouge Parish District Attorney Hillar Moore told the Associated Press that the investigation is still in the preliminary stages and that authorities are not prepared to say whether it was sophomore running back Clyde Edwards-Helaire or freshman linebacker Jared Small who fired the shots that killed Kobe Johnson. Baton Rouge police have said the Dec. 22 shooting occurred off campus, where the players were trying to sell an electronic item. Johnson was not an LSU student. The players traveled with LSU to the Fiesta Bowl and were in uniform for the game. Edwards-Helaire took the game’s opening kickoff 77 yards to set up an LSU field goal. Dwayne Haskins passed for 251 yards and three touchdowns, and Urban Meyer finished his coaching career at Ohio State with a 28-23 victory after the Buckeyes held off Washington’s thrilling fourth-quarter comeback in the 105th Rose Bowl in Pasadena, Calif.
Parris Campbell, Johnnie Dixon, and Rashod Berry caught TD passes in the first half for the fifth-ranked Buckeyes (13-1), who took a 25-point lead into the fourth. But Myles Gaskin threw a touchdown pass and rushed for two more scores for the No. 9 Huskies (10-4), scoring from 2 yards out with 42 seconds left. The Buckeyes intercepted Jake Browning’s pass on the 2-point conversion attempt and then recovered the Huskies’ onside kick to wrap up the final game of Meyer’s seven-year tenure. The 54-year-old coach is walking away after going 83-9 at Ohio State with one national championship and three Big Ten titles. HISTORY FOR BENNY SNELL JR! Benny Snell Jr. ran for 144 yards and two touchdowns to become Kentucky’s career rushing leader and help the 16th-ranked Wildcats (10-3) wrap up their best season in more than four decades with a 27-24 victory over No. 13 Penn State (9-4) in the Citrus Bowl in Orlando. Snell scored on runs of 2 and 12 yards in the second half, then carried for a couple of crucial first downs to help Kentucky run out the clock after Penn State’s Trace McSorley trimmed a 27-7 deficit to 3 points. Safety Jake Gervase made an interception in the end zone to help preserve a late lead and later batted down an errant fourth-down pass to end Mississippi State’s final drive with 25 seconds left as and ball-hawking Iowa Hawkeyes beat No. 18 Bulldogs, 27-22, in the Outback Bowl in Tampa. The Hawkeyes (9-4) totaled just 199 yards, with 75 coming on a touchdown pass from Nathan Stanley to Nick Easley, but they converted three takeaways into 17 points. The Hawkeyes won despite netting minus 15 yards rushing, and their three running backs totaled 4 yards in 15 carries. Trailing 24-19, the Bulldogs (8-5) had a first down at the Iowa 1 early in the fourth quarter, but three quarterback draws lost 2 yards and they settled for a field goal. Oklahoma and Lincoln Riley have agreed to a contract extension, which should quell speculation about the second-year coach being lured away by an NFL team. Riley, 35, has led the Sooners to consecutive Big 12 championships and College Football Playoff appearances. Oklahoma is 24-4 overall and 16-2 in the conference under Riley with two Heisman Trophy winning quarterbacks — Baker Mayfield and Kyler Murray.